Eikan-do Zenrin-ji sits on the southern end of the famed “Philosopher’s Path” that runs along a canal in Northeastern Kyoto. 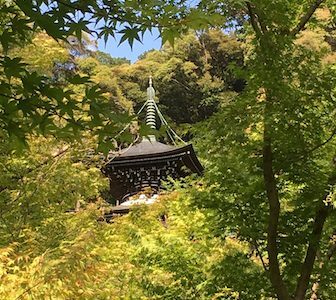 Founded during the mid-9th century, Zenrin-ji is the head temple of the Jodo-shu Seizan Zenrin-ji sect of Buddhism in Japan, and although it’s a popular tourist spot, it’s also very much a living, functioning Buddhist temple. The Japanese term mizuko (literally, “water child”) refers to a deceased baby, infant, or fetus. This includes stillborn and miscarried children as well as those who died by abortion, and in some cases also applies to babies that die shortly after birth. A funerary rite, called mizuko kuyō, is often performed on behalf of these children, and Japan has many shrines honoring mizuko–mostly in combination with statues of Jizō, a kind incarnation of the Buddha who is considred the patron and protector of mizuko. When staying in Japanese temples or ryokan (traditional inns), guests are customarily served tea and a snack (often a regional specialty like a cookie or cake) upon arrival. The approaches to many of Japan’s Shinto shrines and Buddhist temples are lined with vendors selling a variety of edible and non-edible treats. Sensoji is Tokyo’s oldest Buddhist temple, and remains both an active worship site and a popular destination for visitors to the Japanese capital.